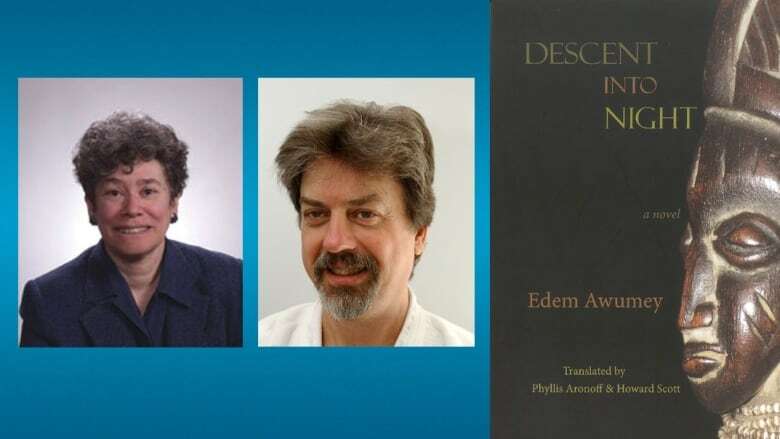 Phyllis Aronoff and Howard Scott won the 2018 Governor General's Literary Award for Descent into Night, translated from the French novel Explication de la nuit by Edem Awumey. Phyllis Aronoff and Howard Scott have won the 2018 Governor General's Literary Award for Descent into Night, translated from the French novel Explication de la nuit by Edem Awumey. Scott previously won the prize in 1997 for The Euguelion and was a finalist individually in 2017 for Social Myths and Collective Imaginaries. As a team, Aronoff and Scott were shortlisted for the prize in 2009 for A Slight Case of Fatigue. Descent into Night takes place in the dark and troubled mind of a Quebec playwright named Ito Baraka, who, in his native West Africa, was abducted and tortured for handing out leaflets with Samuel Beckett quotes. In the novel, Ito frantically documents his life as it speedily reaches an end. Below, Aronoff and Scott discuss what it was like to translate Explication de la nuit into the award-winning Descent into Night. Phyllis Aronoff: We thought it was an amazing book. We also found it a bit daunting partly because we're not familiar with the context of Togo or West Africa, where a lot of it takes place. Howard Scott: We did research on Togo to find out more about the context. It also uses Endgame by Samuel Beckett quite a bit, so we had to reread that and I watched a production of Endgame that I found online. Finding the voice of somebody who is from a different continent and a different culture is challenging. Phyllis Aronoff: It's a mystery to me how it happens. I just know we're plugging away at it and you go over it again and again and you kind of get to a point where you sense that it feels right to you. Howard Scott: You get into the head of the author and the characters when you translate. I have a feeling that you get to know the author better than anyone else. You're really looking at things from the author's perspective and seeing it through their eyes. They say that the act of translation is the most intense form of reading. Howard Scott: ...and then we work it through together after. Phyllis Aronoff: When you're working on a long work like a book, it's fantastic to have another person to bounce things off of. We've been working together for quite a long time, so each of us knows how the other thinks. Two minds really do work better than one. The trick is getting the two ways of seeing. You want the work to be seamless. Some people have said, "Well maybe you do one chapter and the other does the other chapter," but we don't like to do it that way. We like to basically both work on the whole thing. It seems to work for us. Howard Scott: Phyllis is very good with attention to detail, whereas I barrel through the first draft very quickly. Then we have the rough hewn translation to work with him and then she polishes, like polishing the marble after you've roughed it out. Phyllis Aronoff: In terms of strengths, Howard has an ability to focus on a question and think it through. I sometimes get into a froth about something. But he'll tackle it and think it through and I find that very reassuring. Howard Scott: I've always loved languages even when I was in grade school. I was already trying to read French on cereal boxes. Every different language is a different way of experiencing the world. When you learn another language, you open up a new world. It's like exploring another planet. Phyllis Aronoff: I think [translation] the easiest way to write because you never face a blank page. I like to write. I just like working with words. I love getting into getting into somebody's mind the way you can in translation. I mean you could you could sit someone down and ask them everything you wanted to about them, but that would be kind of rude. Translation is a very good way of getting into somebody's head. You read so closely so intensely and so repeatedly. Howard Scott: English is more concrete, as opposed to French which tends to be more abstract. You can't just do a literal translation. There's a certain shift in the way that languages work that has to take place when you translate. You have to make you feel natural in English. Phyllis Aronoff: I heard French really all my life and I mean there are Francophones in my family, but when I started really to speak French I felt like I was discovering a different personality in myself. I think that's something about French. I find it to be a much more lively language. I felt like I could say things in French than I couldn't English. Unfortunately, as I got more accustomed to speaking French, the two personalities merged and I didn't have that experience anymore of being in a different language and breathing a different kind of oxygen. Phyllis Aronoff and Howard Scott's comments have been edited for length and clarity.